Dezeen promotion: lighting brand Zumtobel has worked with Marte.Marte Architects to develop a bespoke lighting system for the huge new halls of the Messe Dornbirn exhibition centre in western Austria. Feldkirch-based Marte.Marte Architects added three extra halls to the huge events venue, which is located in the Austrian state of Vorarlberg. These are accompanied by two new foyers and a flexible seminar room. Zumtobel was charged with creating LED lighting systems for all of these spaces, which opened to the public in July 2017. The biggest challenge was the scale of the rooms – the exhibition halls are 75 metres long with 11-metre-high ceilings. The lighting also had to be flexible, to allow these spaces to meet the demands of various different types of events. To suit these demands, the brand chose to use its Tecton Balanced White system, which form part of The Editions collection. With an 11-pole current-conducting section built into its trunking, this system can create continuous rows of lighting without any visual interruption. The colour temperature can also be adapted, to suit different uses of the space. "This ensures consistently high levels of light quality and enhanced visitor well-being – no matter how the space is used," said Zumtobel. The power supply, controls and connection to the emergency lighting system are integrated into the system. However, lighting sources and optics are easily accessible, so they can be replaced when necessary. Also, the position of each luminaire is flexible, so the system can be adapted following structural changes. 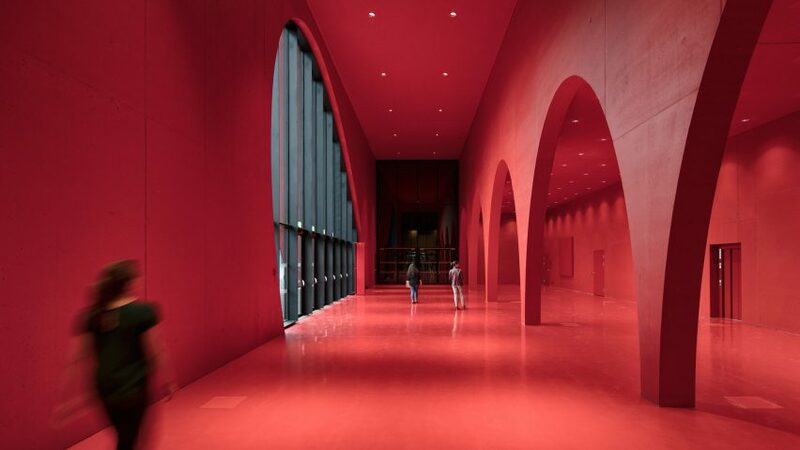 For the bright red foyer spaces, which feature elliptical entrances, Zumtobel chose its Panos Infinity system. These LED downlights are recessed into the ceilings, offering what the brand describes as "a pleasant colour temperature, very similar to daylight". The fittings for both sets of lights were custom made in the colours of the building – black and red – to help them fit in with the architecture. "Architecture is extremely important in our company, as light plays such a crucial role in this discipline," said Manuel Staudinger, a project manager at Zumtobel. "The right lighting can generate completely different effects and spatial atmospheres." "The fascinating thing about light is that it really creates spaces," he continued. "That is why we are especially proud to have realised a project with the renowned Vorarlberg architecture studio Marte.Marte – especially because it is a project in our home town." Photography is by Faruk Pinjo.